Sending service, 2018 Novi Sad General Assembly. Photo: Albin Hillert/CEC. 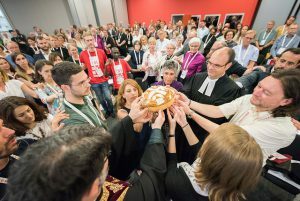 We are a fellowship bringing together 114 churches from Orthodox, Protestant, and Anglican traditions from all over Europe for dialogue, advocacy, and joint action. Together we strengthen our common witness, act in service to Europe and the world, promote peace, and work for the unity of the Church. A network of National Councils of Churches keeps us connected to national and regional concerns and Organisations in Partnership develop our expertise in a number of areas, including diaconia, migration and refugee issues, and women and youth in the churches. The Conference of European Churches emerged as a peacebuilding effort in 1959, building bridges between the East and the West during the Cold War. This original mission carries us forward today as we continue to work for a humane, social and sustainable Europe at peace with itself and its neighbours.